Specimen collection number PTM 441 in the UBC Herbarium Algae Database. Search the collection number in the database for more information on this specimen, or search the species for further occurrences. Images courtesy of Sandra Lindstrom. Stringy acid kelp is a highly branched perennial brown seaweed. Its light brown thallus is composed of a cylindrical central branch with side branches coming the main axis in opposite pairs. This pattern is repeated over multiple orders of branching. 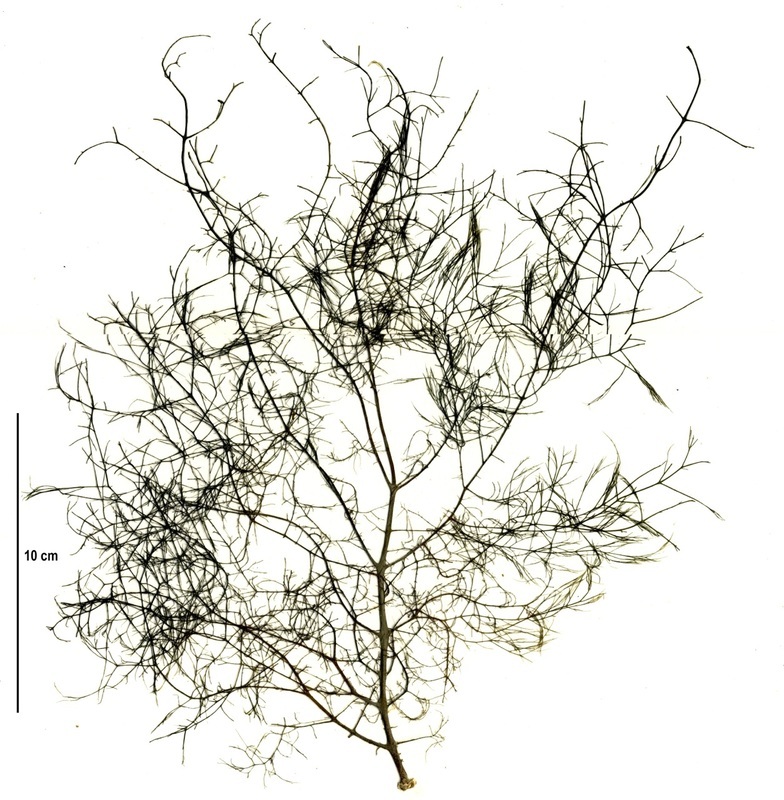 This finely-branched, fragile seaweed grows to 120 cm tall and has a bushy appearance in water. The central axis attaches to a disc-shaped holdfast. This seaweed grows on rock in the extremely low intertidal and subtidal to 45 m deep. It prefers semi-protected to exposed shorelines, and can be found from This species is found on both sides of the north Pacific Ocean — from Korea, Japan, and China north to the Bering Sea, Aleutian Islands, and Arctic Ocean, and from Alaska south to Baja California, Mexico. It is also found in the North Atlantic, the North Sea, and off the coasts of New Zealand, Chile, Argentina, and the Antarctic and nearby islands. Witch's hair (Desmarestia aculeata) is similarly stringy and highly branched. It tends to be darker in colour, grows to 2 m tall, and has an alternating branch pattern instead of opposite. Golden sea hair (Dictyosiphon foeniculaceus) is also similar, though its branching pattern is not always opposite (can also be alternate or irregular), and it grows on other seaweeds and in free-floating mats as well as on rock. This species is the most acidic of the acid kelps. It releases sulfuric acid when it gets damaged or dried out; this harms both the individual itself — turning it dull green — as well as other seaweeds nearby. Lindberg, M. and Lindstrom, S. (2010). Desmarestia virids Stringy Acid Kelp. Seaweeds of Alaska. Accessed 11/04/2016. O'Clair, R. and Lindstrom, S. Desmarestia viridis (Muller) Lamouroux. In Klinkenberg, Brian. (Ed.). E-Flora BC: Electronic Atlas of the Plants of British Columbia. Lab for Advanced Spatial Analysis, Department of Geography, University of British Columbia, Vancouver. Accessed 11/04/2015.